Everything was supposed to be celebration for the Mexican National Soccer Team and the head coach Miguel "El Piojo" Herrera after taking home the Gold Cup. 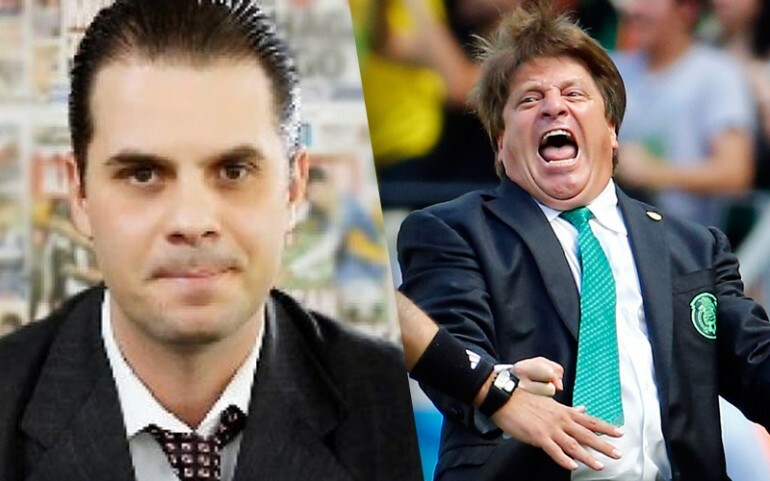 After a night of celebration, "El Piojo" was not having it with a TV Azteca sportscaster that had been criticizing him for a while now. Christian Martinoli had been egging Herrera on social media. About a month ago they both had an exchange on Twitter with a threat coming from the Mexican coach. "I love the elegance of the national coach. He is not a cheerleader he is 'barrabrava.'" This last term seemed to offend the soccer manager, which has grown to be a synonym to "hooligan." Herrera replied with the following message: "I am not that but hopefully I will find you someplace so we can settle our differences." RELATED: See 'El Piojo' Herrera Attacking Martinoli Memes That Will Have You ROFL! Fast forward one month and Mexico taking home the trophy and Miguel Herrera got his wish. David Medrano, an Azteca reporter, tweeted: "[Christian] Martinoli and Luis Garcia were in line going through security [at the airport] when Herrera arrived and punched him on the neck." Medrano went on to later talk to Ciro Gómez Leyva from Radio Fórmula to expand on the incident. "Christian and Luis arrived at the airport at around 7:20 in the morning to the Delta terminal and that's where the first contact was made. They encountered Miguel Herrera, his daughter and people dressed in civilian clothes that we couldn't identify if they were part of the team. They registered their luggage and go ahead to security. As they are going upstairs, Miguel Herrera comes and throws a punch at Christian. Due to the height difference, the contact was made to his neck and not his face. Christian moves, he hits him in the neck." Luis Garcia, also a sports commentator at Azteca, was received a beating from Herrera's daughter. "Luis Garcia intervenes and he received a slap from Miguel Herrera's daughter," Medrano added. "People started noticing and they separate them and it all ended there." Martinoli gave his side of the story and said the following: "I lowered my head to see my phone and that's where I felt the punch on the neck." He also added that Herrera threatened him that every time he saw him, something similar would happen. "El Piojo" is denying the altercation telling TDN reporter, "I am not stupid to hit him." Herrera, allegedly, only got close to Martinoli to make him stop talking about his family.